Some people are good at practice but then become nervous and cannot perform well during the game, while others are able to take advantage of the adrenaline rush during the actual game. What causes these different reactions? To answer this question, we interviewed Dr. Tetsuya Ijiri and Dr. Makino Kashino. Dr. Ijiri is a young researcher working on the extraction of “mental components” from biometric data under the Sports Brain Science Project. —What kind of research are you currently working on? Ijiri: Right now we are trying to understand the condition of the mind and body of athletes during games by measuring heartbeat and acceleration using hitoe (Refer to Article 5). People’s heartbeats change significantly in accordance with body movements during exercise. Likewise, even when a person is not moving, heart rate may also vary depending on the person’s mental state, like when the heart beats faster when one becomes nervous. In other words, heart rate during games may fluctuate depending on movements, and may also vary depending on the level of tension or relaxation. The goal of this research is to isolate these two components and understand changes in heart beat arising from psychological factors. Specifically, first, using hitoe we measure the trunk acceleration and heart rate of the subject during practice. Trunk acceleration is an approximate expression of the intensity (stringency) of exercise. And then we create a model (relational expression) of the relationship between the acceleration and the changes in heart rate. Acceleration and heart rate are also measured during the actual game, and, using the model prepared from measurements during practice, heart rate is predicted from the acceleration obtained during the actual game, to determine differences in predicted and actual heart rates. This difference represents a simple component that is independent of the intensity of exercise, or a component that reflects the psychological state exhibited particularly during the actual game. This is depicted in a graph in Figure 1. The x-axis shows the intensity of exercise computed from the acceleration, and the y-axis represents the measured heart rate. 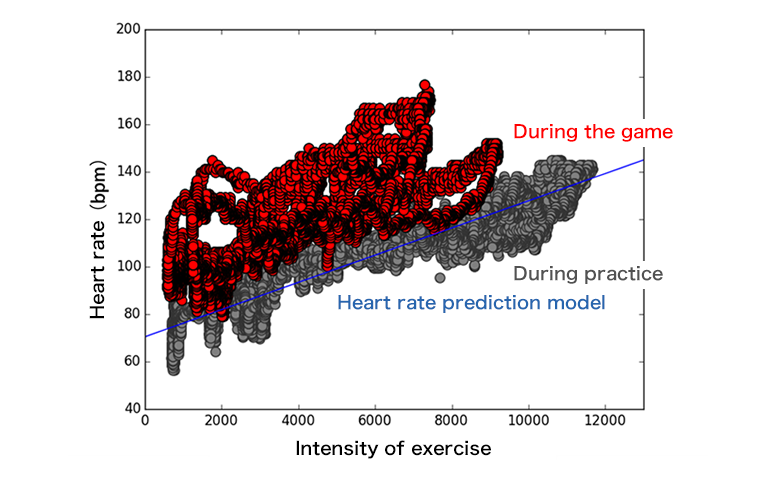 This graph shows the relationship of the intensity of exercise and heart rate during practice and during a game of baseball for a certain subject. Compared to those during practice (grey points), the heart rate is higher during the game (red points) for the same level of intensity of exercise. 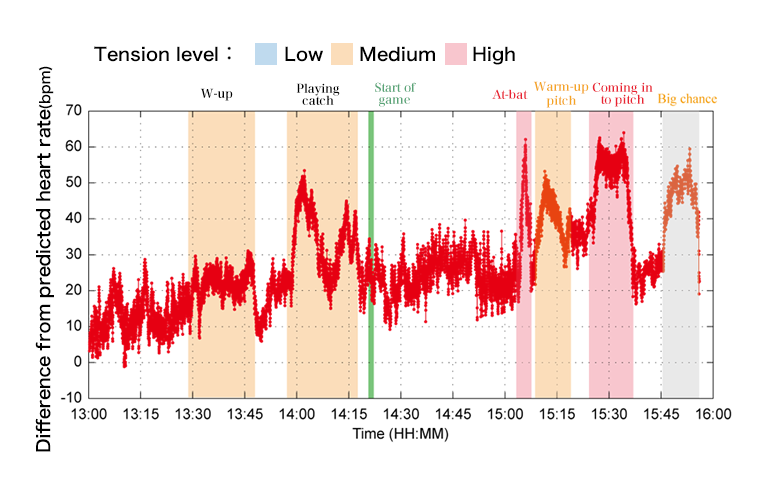 Further, Figure 2 shows a time-series graph of the differences in actual and predicted heart rate values based on acceleration data during a game. The graph shows an increase in heart rate as the game approaches. 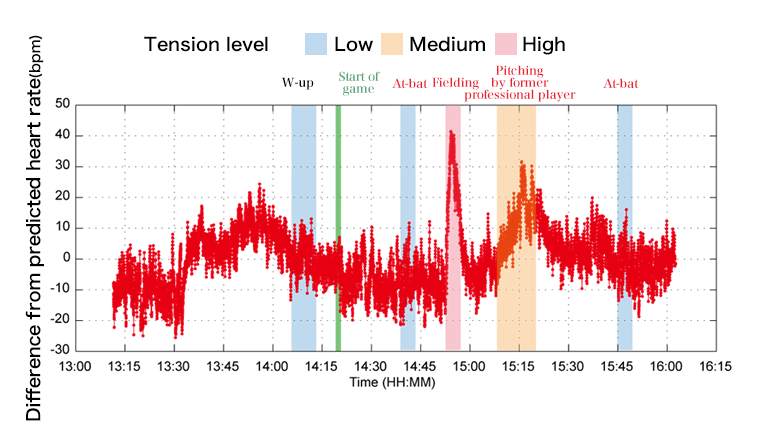 It also shows that heart rate increases not only during exercise, such as during warm-up at the bullpen and when coming in to pitch, but also even after pitching while sitting and watching the game from the bench, in response to particular events during the game (e.g., exciting scenes, etc.). These data actually belong to Dr. Kashino, where he took the mound on the second game as a member of the Tokyo 18’s team, a baseball team formed for research purposes by University of Tokyo Professor Kimitaka Nakazawa and included former professional baseball player Masumi Kuwata. So it seems that he was pretty nervous when he came in to pitch (laughs). Kashino: Who would not feel nervous (laughs), with many former professional baseball players like Kuwata-san and other high-level and experienced players around? I took the mound at a time when we were leading by only one point, and we would lose if I could not throw a strike. To begin with, although I have practiced pitching for many years, I had very little actual game experience. Ijiri: There’s no other baseball player an experience like that (laughs)—to be able to play with Masumi Kuwata on your second game. I admire your guts! Kashino: Rather than my being nervous, I was actually more aware of my stiff movements. When I caught a ground ball and threw the ball to the first base, I short hopped the ball, something that I would not normally do, so I was surprised with myself, too. However, even though I have pitched in a total of only four games in my entire life, I wonder if I would be like this every time I play a game, though there’s little basis for making a comparison. Ijiri: During this time, it seems his pitching interval was unusually fast. Upon receiving a return toss from the catcher, he was already getting ready to throw the ball even before the catcher could sit down, and the batter was still not ready. From first base where I was, I tried to tell him to slow down, but he seemed to not have heard it at all. Kashino: It seemed that I was unaware of what was happening. They say that the maximum heart rate per minute is 220 minus your age. Since that’s around 170 for me, the data shows that I almost reached my maximum heart rate when I was pitching, so that was a bit dangerous. Also, during practice I wound normally be able to throw a hundred balls at speeds of around 100 km/h without feeling tired, but on this day, I was completely exhausted after pitching only around 20 balls. It means that I used up my energy because of my increased heart rate caused by tension, rather than by the intensity of exercise. At any rate, when your heart rate rises this much, then your performance would be affected. Ijiri: Figure 3 is a graph of my data, and it shows that I felt no tension at all. I wonder if that’s called an absence of tension or just a lack of motivation (laughs). The variation in my heart rate is minimal. —Were you aware of your not feeling any tension? Ijiri: No, I wasn’t. During my second turn at the plate (at around 15:45), we were at the critical stage of the game wherein if I make a hit then we win, and if I make an out then we lose. But even then, my heart rate did not rise. I ended up throwing a weak swing and was out, so we lost. I knew that I needed to do my best, but my performance that day was quite poor. I was not really into the game because the whole time I kept worrying about the measurements. Kashino: It was I who had my heart rate increasing as I was watching his batting from the bench! (laughs). But strangely enough, it wasn’t that I was cheering for him to make a winning hit, rather, I was actually feeling quite exhausted and without energy at that time after my turn at pitching. So, this result is quite surprising. Ijiri: My results, however, are a mystery (laughs). On this day, not only Kuwata-san was there, who was my big idol since when I was young; former Yomiuri Giants player Koichi Misawa was also there as a member of the opponent team. When I was in elementary school I watched high school baseball on TV, and I had looked up to Misawa-san, who was an ace player of Teikyo High School at that time. It was the first time for me to meet him that day; and although I was quite star-struck deep inside, my heart rate actually did not go up. The only time my heart rate increased was when I was fielding; I was a first base fielder and the ball came flying towards me and I thought I was going to get hit by the ball. —You said earlier that you were “not into the game,” but what does it mean to be “in the game”? Ijiri: I’m not really so sure myself, but I think for most sports, athletes need the right level of tension during a game; because the body reaches an optimal condition after experiencing some tension. It gets you into the mood or gets you worked up, so to speak. I didn’t experience it that day. I remember those times when I was so much into the game and I performed really well during my playing days. It’s kind of an ideal but elusive state that you cannot recreate at will. I do think that this is a problem shared even by high-level athletes. For this reason, some athletes follow a strict warm-up menu and ceremoniously go through the same schedule before a game. I think they are probably trying to somehow minimize fluctuations in their environment. —An athlete’s mental and physical condition would differ everyday even during practice, wouldn’t it? Ijiri: Yes, performance-wise, every day would be completely different. You’ll have an excellent performance the previous day but wake up to a completely different state the next day. But then, there are days that you are suddenly able to do what you could not just the previous day. We hope to be able to analyze those day-to-day fluctuations based on biometric data. —Are there other similar researches to what you are doing? Ijiri: There is hardly any. There are researches that analyze physical activity in terms of how much metabolic equivalents (METs; metabolic index during exercise) are consumed based on acceleration data, i.e., physical activity data, under controlled environments. There are very few studies, however, that deal with variations of the mental state based on a wide range of conditions, such as while hitting the ball or running, in an actual environment. To begin with, it was difficult to perform measurements under such conditions. With the use of recently developed wearable sensors like hitoe, however, it has become possible to obtain biometric data during exercise, likewise making our research possible. Kashino: There is a long history on researches that look into a person’s state of tension during a lecture or other situations by extracting sympathetic and parasympathetic nerve activities from heart rate variations during rest. These methods, however, cannot be used in sports and other situations that involve intense movements. Meanwhile, there are an increasing number of professional sports teams that measure their athletes’ heart rates and other biometric data and use them as physical indices of metabolism and exhaustion levels. In major league baseball, for example, they use something called “sabermetrics,” where batting, fielding, and base-running performances are empirically analyzed using statistical methods in order to evaluate athletes’ performances and formulate game strategies. Although there is an increasing trend in the use of data in sports, the use of data to look into the mental state of athletes has only started. Thus, developing new methods for measurements is actually one of our research themes. And, once we accumulate enough data, we will be able to analyze the ideal heart rate condition that would enable an athlete to exhibit his or her best performance. We would like to come up with data to support observations that have thus far been supported only by anecdotal evidence. The mental state, however, is subject to influence by a wide range of factors, such as temperature, humidity, climate, waking time, opponents, etc., which means that a considerable amount of data is needed to segregate those factors and find the appropriate state of tension. That’s why we are currently collecting data everyday. —Please tell us about the future prospects of your research. 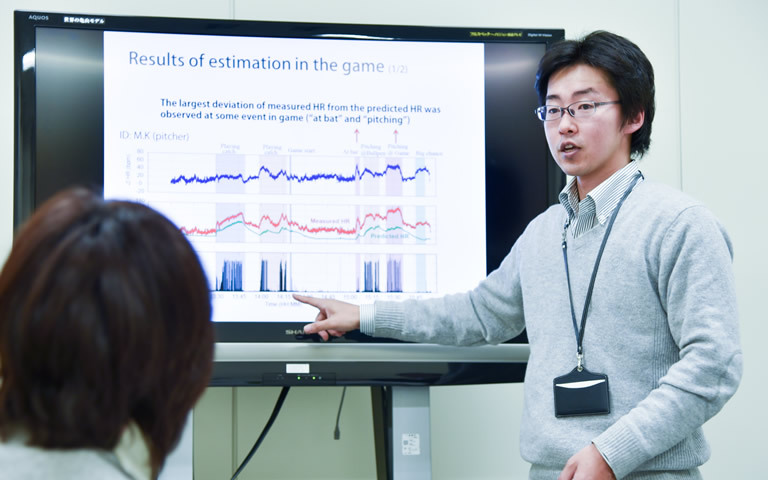 Ijiri: Actually, for me, this coming April, I will be going back to join the research group of Professor Kimataka Nakazawa at the University of Tokyo and continue to work on the Sports Brain Science Project in collaboration with NTT Communication Science Laboratories. Incidentally, Professor Nakazawa is also a member of Kuwata-san’s sandlot baseball team (Tokyo 18’s). First, we will try to find the conditions for exhibiting the best performance using measurements, and then we will determine the right method for creating the proper mental state based on those conditions. If we can increase an athlete’s performance even by just one percent, then I think we can say we have succeeded. Kashino: For example, it would not be easy to reduce even by 0.1 seconds a 10-second record for a 100-meter dash. Even achieving a personal best of 1km/h in pitched ball speed is more difficult than I imagined. If our research can lead to stably improving an athlete’s performance, then that would be a major achievement for us.